It has nothing to do with Christmas – Christmas is a time of good cheer, and there’s nothing like that in any of the chapters which you are about to read. It is nothing to do with the Christmas song. There are no gifts being handed around – only tragedy, heartbreak, and disappointment feature within the lives of a number of players in the dramas which unfold before your eyes. Set in the industrial areas of Amber Valley, Derby and Nottingham, ‘Twelve Days’ peers into the secrets of some of its inhabitants, taking you on a journey through their lives and sharing with you all of the emotions which they face as their stories progress. Not for the faint-hearted, be ready for murder, witchcraft, embezzlement and a touch of the paranormal as the book takes you into the murky world of crime. Twelve days: each one a focus for an individual or a family with something to aim for. Not a single day, but the day when all of the events of a period come together to form an outcome, be it happy or sad, fortunate or tragic, comical or sombre. For DI Jamie Dominey it was the end of a working week – the week before Christmas when he’d promised his little girl that Daddy would be home in time for Christmas Eve. Events were to hamper all of his good intentions; people die or are killed at the most inconvenient of times. Alice and Ted Calladine, at the East Coast in February, both knew that this day would be their last chance to relive some special memories. Terminal illness was to provide an insurmountable barrier to a summer which was beyond their reach. Jackie Blackett’s day came when she discovered things about her husband which had been hidden from her for a number of years. That day changed her life when an Old Master fell into her lap – a painting worth £750,000 concealed in a secret compartment in her home. Deirdre Kavanagh believed herself to be untouchable – such was the fear which she was able to instil into the minds of those crossing her path. Detective Sergeant Malc Frogson provided a stumbling block to her ambitions, and her day, she decided, would be one that he would regret. For Sophie Hollinshead, the return to work of the misogynistic DCI John Barron was an event she had dreaded. Her career as DI at Radford Road in Nottingham looked set to come to a sudden end. Her day came with a confrontation which freed her from his overbearing control forever. Sally Hindson seemed set to inherit her father’s farm upon his death. Not that she wished the cantankerous old bugger any harm, but when temper got the better of her she snapped. Believing herself off the hook when opportunistic burglars looked set to take the fall, she was set to rue her particular day when complacency set in. The Seven Swans pub in Bendridge had a pull for Alan Craig and he thought that his day had come with the lottery win which allowed him the financial muscle to buy the derelict pub and turn it into his dream business. He was wrong. Nicholas, the mysterious visitor brought fortune as well as a warning. Wendy Searson’s time was, seemingly, running out, but the day she met Peter Shaw everything changed. One of the Eight Maids who, in 1960, had a minor chart hit, she was now the sole survivor of that group of young women. Her day came with a change in fortune and a visitor whom she had never thought to see again. Miranda Wheatley’s opportunism gave her and her young son a way into the kind of riches that she had only dreamed about. The day her boss crossed her was one that he would never be able to regret. Her day came with the news of his tragic death on a Caribbean holiday – a holiday when he had left her to run the company in his absence. Jim Fraser shook his head in despair – a vigilante on the streets of Ilkeston was the last thing he needed. As a senior DI with the town’s CID, he was taking the brunt of the publicity and was also feeling the pressure from those on high within the division. His day came with an unexpected fatality at junction 25 of the M1 motorway – a death which brought a macabre smile to his craggy features. Thirty years – a period which saw William Parker change from a frightened little boy into a confident, gifted individual. The box had lain almost forgotten amongst his possessions until the day he met Jeannie MacDougall. His old school teacher, Robert Jenkins, knew the significance of the artefact, and William’s day came on a chilly morning in a misty Scottish Glen. John Cherko had, he believed, many days. Head of a prosperous conglomerate, he answered to no-one, and ran the enterprise with a ruthlessness born from unchecked company growth. His day fell apart with the disappearance of twelve of his robot workers; the Drummers had simply vanished. It changed dramatically when they suddenly re-appeared. 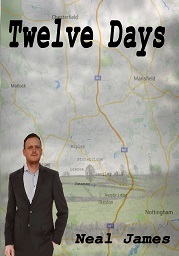 ‘Twelve Days’ tells the story of a number of inhabitants of Amber Valley, Nottingham, and Derby as their lives intertwine and their fates take a number of very different paths to the ones they believed they were destined to tread.